One North Texas team's touchdowns are worth a lot more than seven points. 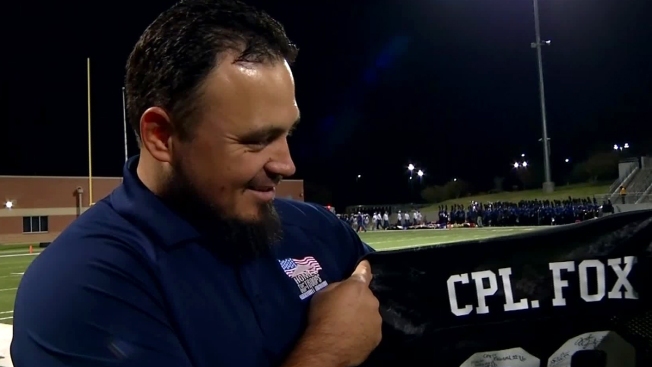 Every time the Byron Nelson Bobcats score a touchdown, a veteran who lost both of his legs in combat in Afghanistan is closer to moving into his new home. Player Joshua Johnson is getting people to pledge money each time the Bobcats score. The money goes to Homes for Our Troops, which is building a house in Rockwall for Marine Cpl. Michael Fox. "What he is doing is not something extraordinary; what he is doing is the right thing," said his Johnson's mother, Shelley Brandt. "My mom and her parents and the rest of her family have just taught me simple values that will go a long way in life, like respect, honesty and loyalty," Johnson said. The Bobcats have won most of their games, so Fox is winning, too. So far, the team has raised almost $10,000. "It was really cool finding out someone who doesn't know me -- especially as young as he is -- to raise money to go towards our house. [It] is incredible," Fox said. Johnson and Fox met for the first time on Friday. Fox attended Friday night's game and sat with Johnson's family until halftime. Fox, who won't move to North Texas until the house is done, flew in for the game. At halftime, he was honored at midfield. Johnson presented him with a jersey signed by the whole team. "That is going on the wall," Fox said. "I am very happy about it -- very cool."